This recipe for Butternut Squash and White Bean Stew is a hearty, vegetable-packed stew, perfect for a chilly winter dinner. 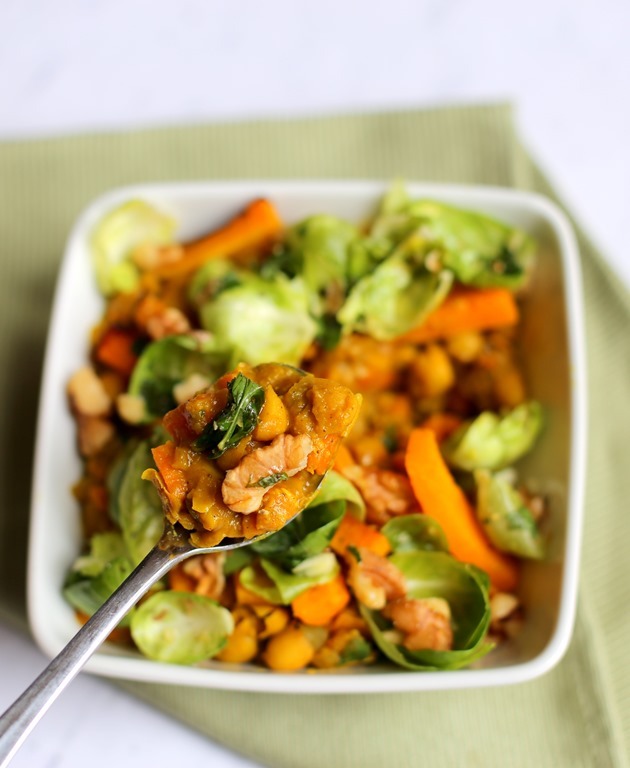 Made with sweet roasted butternut squash, warm curry spices and bright marinated Brussels sprouts it’s a delicious dish that will have you coming back for more. Thank you so much to Blue Apron for sponsoring this post and for the incredibly tasty recipe! 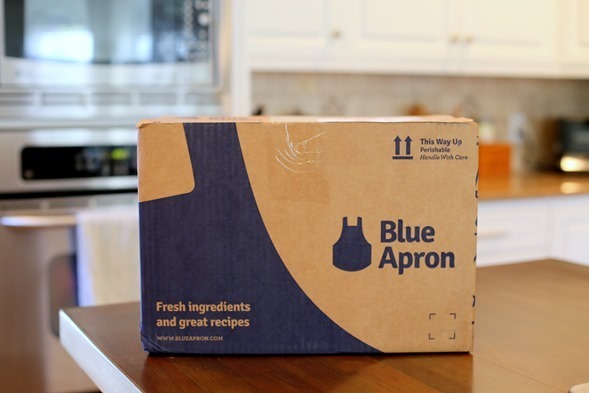 The first 25 PBF readers who wish to try Blue Apron may click here to receive 3 free meals off their first order. This past weekend was a wet and dreary one in Charlotte. I’m not sure I saw the sun peek through the clouds one time all weekend which meant comfort food sounded perfect all weekend long. Warm and hearty stick-to-your-ribs dishes that warm the belly and soul! Thankfully I had my latest Blue Apron delivery on hand and all of the ingredients I needed to assemble the tastiest butternut squash and white bean stew on Sunday afternoon. Truth be told, Blue Apron’s vegetarian dishes are my absolute favorite because I feel like they help me easily put together filling and delicious meat-free dishes which is something I can sometimes struggle to do on my own. I also think the portions of the vegetarian meals are larger which is a plus when you’re feeding two adults with large appetites. On Thursday last week, we received all of the high quality farm-fresh ingredients we needed to create three chef-designed recipes and every single one from the Za’atar-Roasted Broccoli Salad to the Fresh Fettuccini with Beets, Goat Cheese and Poppy seeds was a home run in our house. But the star of our latest delivery was, without a doubt, this butternut squash and white bean stew! To make the recipe, I simply followed the detailed recipe instruction card, complete with picture tutorials and within an hour, Ryan and I were digging into a filling and vegetable-packed stew. We both raved about this recipe and I immediately added the recipe card to my recipe binder because it’s a recipe we will absolutely make again. Next time I will double the recipe though because I found myself wishing I had leftovers to dig into for lunch on Monday! 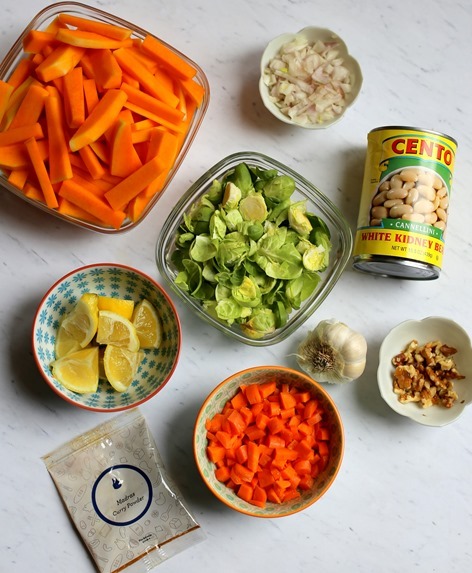 This recipe for Butternut Squash and White Bean Stew is a hearty, vegetable-packed stew, perfect for a chilly winter dinner. Made with sweet roasted butternut squash, warm curry spices and bright marinated Brussels sprouts it’s a delicious dish that will have you coming back for more. Using a knife, peel the squash. Separate the neck and bulb; halve the bulb, then scoop out and discard the pulp and seeds. Cut into ½-inch-thick pieces. Cut off and discard the Brussels sprout stems. Pick off and reserve the leaves; discard the cores. Using a peeler, remove the lemon rind, avoiding the pith; mince to get 2 teaspoons of zest (or use a zester). Quarter and deseed the lemon. Pick the parsley off the stems; discard the stems, then finely chop. Peel and mince the garlic; smash with the side of your knife until it resembles a paste (or use a zester). Peel and small dice the carrots. Roast the squash: Place the squash on a sheet pan. Drizzle with olive oil and season with salt and pepper; toss to thoroughly coat. Arrange in a single, even layer and roast, flipping halfway through, 20 to 22 minutes, or until browned and tender when pierced with a fork. Remove from the oven. 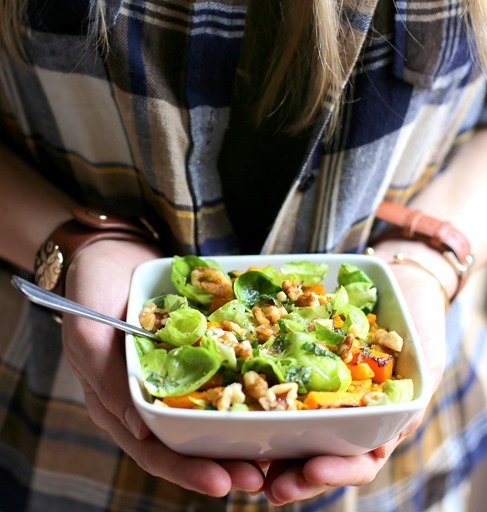 Marinate the Brussels sprouts: In a bowl, combine the Brussels sprouts and the juice of 1 lemon wedge. Drizzle with olive oil; season with salt and pepper. Set aside to marinate, stirring occasionally, for at least 10 minutes. Make the gremolata: In a bowl, combine the parsley, lemon zest, the juice of 1 lemon wedge and up to ¼ of the garlic paste. Drizzle with olive oil and season with salt and pepper to taste. Stew the beans: In a large pan (nonstick, if you have one), heat 2 teaspoons of olive oil on medium until hot. Add the shallot and remaining garlic paste. Cook, stirring frequently, 30 seconds to 1 minute, or until fragrant. Add the carrots; season with salt and pepper. Cook, stirring occasionally, 2 to 3 minutes, or until softened. Add the curry powder;cook, stirring frequently, 30 seconds to 1 minute, or until fragrant. Add the beans and ¾ cup of water; cook, stirring occasionally, 4 to 5 minutes, or until slightly reduced. Turn off the heat. Mash some of the beans against the bottom of the pan. Finish & plate your dish: Add the juice of the remaining lemon wedges and half the gremolata to the pan. Stir to thoroughly combine and season with salt and pepper to taste. Divide between 2 dishes. Season the marinated Brussels sprouts with salt and pepper to taste. 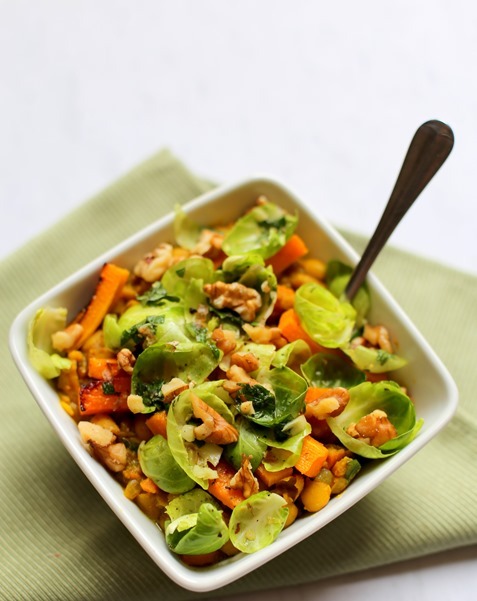 Top the finished beans with the roasted squash and seasoned Brussels sprouts. Garnish with the remaining gremolata and walnuts. Enjoy! 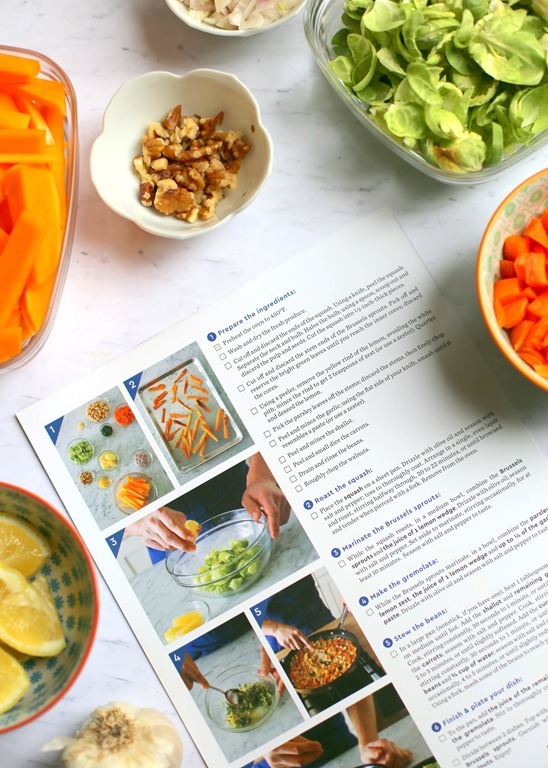 If you would like to try Blue Apron for yourself, simply click here and the first 25 PBF readers will receive THREE free meals on their first Blue Apron order. I hope you love the recipes as much as we do in our house! Happy cooking my friends!! I made a butternut squash and black bean chili this weekend, which was a huge hit. This recipe sounds equally delicious! I think butternut squash is my new obsession. It adds great texture and nutrients to a dish without an overwhelming flavor. I always struggle with coming up with vegetarian dishes too. I love meal service plans, especially for really busy weekends when I don’t have time to go to the grocery store. I am so glad you shared this recipe! When you shared a picture of it on Instagram I was dying to make it myself. We eat vegetarian at home, so I’m always looking for new recipes to break up the monotony. ❤ I will definitely be picking up these ingredients this weekend. Thanks again!! This looks SO good. I have never tried Blue Apron, but I have wanted to for a long time now. For some reason subscription packages scare me? Not sure why. I tried a wine delivery service for a while and eventually ended up canceling it. I would love to incorporate even one Blue Apron meal a week. With both my boyfriend and I working full time and having various hobbies, we still want to cook at home, but definitely want it to be simple. And I love chopping veggies when I have all the time in the world, but after being gone at work all day, it’s the last thing I want to do when I get home and am just hungry and want to eat immediately! Thanks for sharing this recipe! 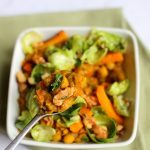 I like to make a few non-meat dishes throughout the week, but it does seem harder to make a filling meal (especially by my husband’s standards) without the meat. I’m looking forward to trying this stew over the weekend! 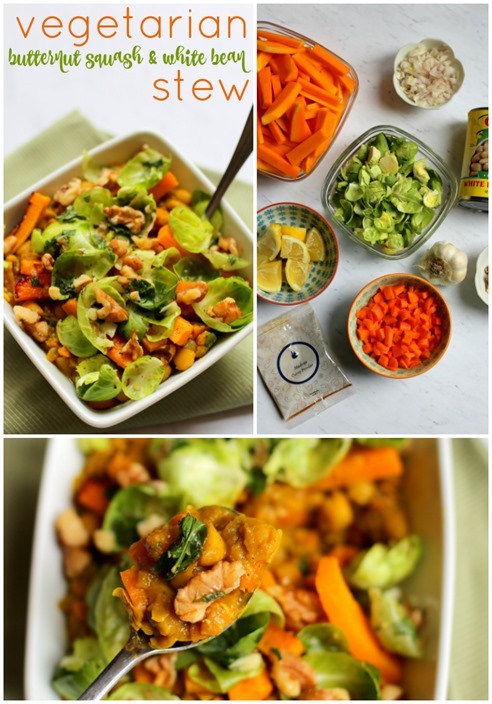 Can’t wait to make this when I am done Whole 30! Missing my beans. We have our first Blue Apron box coming next week and I’m super excited! We just received our second Hello Fresh box and really like those. Going to try Home Chef next and then see how they all compare! I truly enjoy the subscription meal boxes because they are so fun and keep the creative cooking skills fresh that I wouldn’t normally use on my plain simple meals I make!